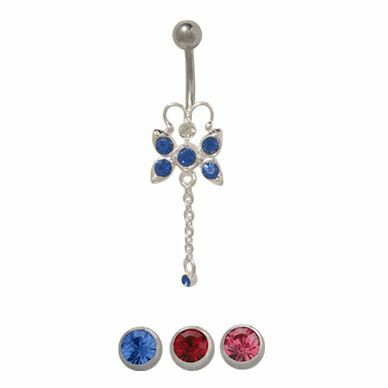 Step out in style with this high quality .925 sterling silver dangling butterfly navel ring with a 316L high grade surgical steel shaft. Dangling design is complete with cubic zirconia jewels in your choice of dark blue, red and pink. Each item sold separately. This belly ring is 14 gauge and the length is 10mm - 3/8 of an inch. The externally threaded top bead size is 5mm and the bottom is 8mm. Entire piece is nickel free.